In the early 1970s, Joy Toys was competing in a changed market. The removal of tariffs meant that toys produced more cheaply in Asia were able to flood the market, and this led to the closure of a large proportion of what had previously been very successful Australian toy companies. This catalogue, produced in about 1971-3, illustrates the changing production that Joy Toys undertook, to try and remain in business. It was a time of transition, from the more expensive and labour-intensive quality of the 1920s-60s, to cheaper, synthetic (and more competitive) toy production. The range of teddies shows that the company still produced their quality mohair, jointed teddies. Each had brown velour pads, glass eyes, and the Joy Toys embroidered smiling mouth. This traditional style of teddy came in five sizes. Along side these bears, were the unjointed synthetic teddies and pandas. In bright colours and with plastic google eyes, they could be offered for sale at a much lower price. Other versions of this style had long, tipped synthetic fur. Interestingly, the smaller teddy and panda, with outstretched arms, were sold in clear plastic cylinders! The company also produced a range of animals. Giraffes were available in sizes from 41cm to 117cm, with a similar 'look' to those made in the 1950s, but with slightly different materials and with plastic (not glass) eyes. Lions and tigers, donkeys (from 32-104cm), cats, dogs, ducks, kangaroos and chickens in various styles were also offered, as was a golly. Novelty toys were popular. Pouffes were made in a range of animals, in colourful synthetic fabrics, with plastic eyes and were solidly foam-filled. 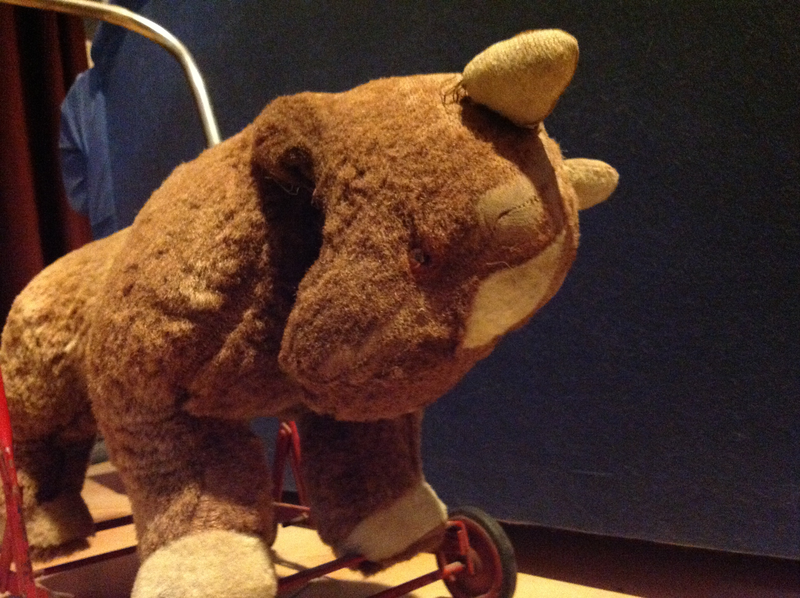 Wheeled ride-on animals, in sizes from 38-53cm, could also be used as walkers or pre-walkers. These were mostly animals, with the additional of a train! Similar to the 1950s and 60s versions, they had plastic eyes though, and red or purple tags. Joy Toys, unfortunately, was unable to remain in business, and closed in 1976. We have decided to sell some of our collection of teddies and soft toys at this fair! We will be selling many toys by Joy Toys, Verna, Emil, Jakas, and Lindee, as well as many very old koalas, teddies and toys by Steiff, Hermann, (etc) and the very earliest Humphreys! (All will be at reasonable prices). If you are able to come along, please feel free to say 'hi'-we'll be the ones behind the table full of old soft toys! I was trying to find out a little bit more about my teddy. What a cute teddy! He is made from beautiful cream mohair, with felt pads, and is stuffed with kapok. By his nose shape, ears, claws, and leg shape he is most probably English, and made in the 30s-40s. Farnell and Merrythought both made similar teddies, and so he may have been made by one of these two companies. I have a Joy Toys horse which was given to me as a child. 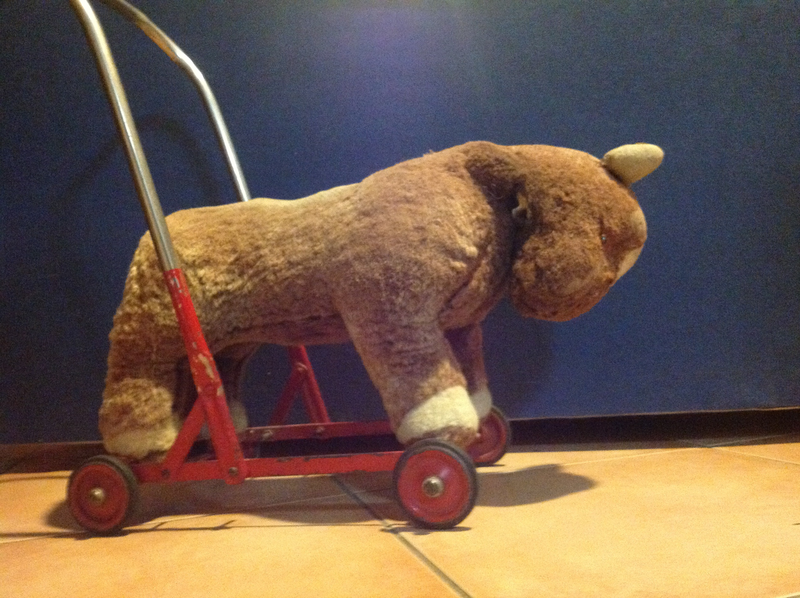 It has a white tag on the belly with green writing ” Joy Toys made in Australia” do you know what it would be worth. Hi I also have a horse, he has a label which says Joy Toys Australia which is white with green writing. I would like to find out more about him. He needs work and has been well loved. Can anyone help me with information please. He has wonderful character! He, too, would have been made in the 50s or 60s, from artificial silk plush, and probably stuffed with kapok. If his eyes are missing, they can be replaced with glass eyes (amber, with black pupils) from a craft shop, and using a long ‘doll’ needle. I have never seen dolls such as these, nor in such excellent condition! They are made of felt, with pressed felt faces, and would have been hand-made. They date from the 1930s-40s! I believe they are one of a kind, and possibly made for a trade show, and not for the public. Their value is therefore hard to determine, as collectors would be very interested. I would guess their value to be $600-$1000! If you are able to post a picture, that would help greatly in giving a more accurate valuation. His tag says he was made in the 50s or 60s. Features such as what fabric he is made of, whether he has glass eyes, his size, and what he is stuffed with, all influence his value. Hi ! I am just finding out about Joy Toy and was hoping someone could help me or lead me in the right direction. I am looking for any information on the four Wizard of Oz Dolls the company released in 1939/1940. I have seen an old catalogue page with Dorothy, Lion, Scarecrow, and a Tinman being mentioned. Does anyone have any actual photos of these pieces or know anyone who may be looking to sell theirs? Any help would be greatly appreciated!! How Old Is My Jakas Teddy Bear?